Is Alix Bailey Lesbian ? The highly renowned painter Alix Bailey is widely known for being the ex-wife of director, producer, actor Louis CK. She is a painter based in New York and has a studio in Manhattan where she mostly paints and shows her creativity and skills. Bailey conducts both solo and collaborative exhibition where she showcases her incredible paintings. Besides she has also acted in few films like "Tang", "Tomorrow Night" and "Spooky Stakeout". Alix Bailey was born to painter parents Sandra Bailey and William Bailey on February 3, 1967, in the United States. She was raised in New Haven, Connecticut, and Italy. Her Italian parents were the one who inspired her to paint earlier on. In her early days, she used to paint self-portraits of her family, friends and some models to explore her painting skills by different angles. She attended Bennington College in 1989 where she studied painting with Sidney Tillim and Pat Adams gaining a degree in Bachelor in Arts. To brush of her painting skills she took painting classes at Vermont Studio Center. Later on, she enrolled at Indiana University in 1994 from where she graduated with an MFA degree. Alix Bailey is professionally a painter and actress who is known for her performances in movies Tang, Tomorrow Night and Spooky Stakeout. She is based in New York City and Tafhkanic NY where she paints and earns her living. 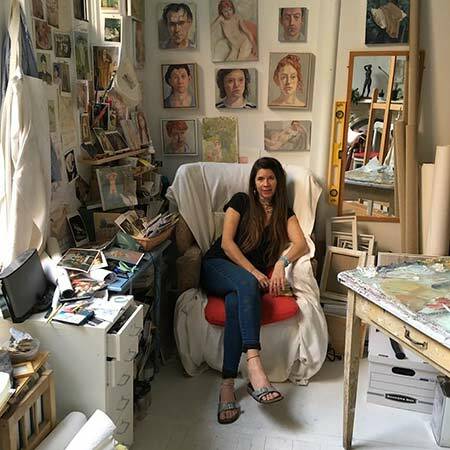 Bailey is a member of the Painting Center who has showcased many of her incredible paintings in Connecticut, New York, and Italy. She has a studio in Manhattan which has a light white background where she mostly paints human pictures. Bailey says she likes to work in a lit environment since she likes natural lights. Recently on February 1, 2018, she conducted her solo exhibition at the Painting Center in New York. Her other exhibition happened at John Davis Gallery, Hudson, New York from May 26, 2018, to June 17, 2018. She has done collaborations with other artists and conducted exhibitions in Italy, New York, and California. The highly renowned painter Alix Bailey is a Manhattan-based painter who has managed to establish a very good career. Her major source of income is from her exhibitions and selling her paintings. Her net worth is estimated to be $35 million and $25 million according to Celebrity Net Worth and The Richest respectively. She earned around $9 million in 2015. In 2016, she and her ex-husband had bought a studio apartment in New York City which costs around $564,900. He has a house in New York City which is estimated to be $2.4 million. Alix Bailey was formerly married to actor, comedian, producer, and director Louis C.K. The couple married in 1995 and after living together for 13 years they decided to separate. Their divorce finally happened in 2008 and are living a happy life on their own. According to many sources, the divorce happened because of Louis's involvement in many controversies. Louis was recently accused by a handful of women for sexually harassing them. Maybe this was the reason his Alix divorced him back in the day. They have two children together named Mary Louise Szekely and Kitty Szekely who are raised by both their parents. Kitty was born in 2002 and their another daughter Mary in 2005. She stands a height of 5'5 and weighs around 54 kg. The mother of two is maintaining her personal life far from the media and fans. She is not active on social medias like Twitter and Instagram. Is she dating a new boyfriend? Well, the question is still remain to be answered. The couple married in 1995 and after staying together for 13 years they separated in 2008. They have two daughters together. Louis CK and Alix Bailey gave birth to their first born a daughter named Kitty Szekely in the year 2002. Louis CK and Alix Bailey gave birth to their second daughter named Mary Louise Szekely in 2005.